A woman suspected of starting a fire in a Paris apartment building which killed 10 people on Tuesday had just been released from a psychiatric ward, according to Paris Prosecutor Remy Heitz. The woman in her 40s who lived in the building is thought to have been treated 13 times in psychiatric facilities between 2009 and 2019. The woman did not have any convictions on her criminal record but was implicated in two lawsuits in 2016, which included setting fire to clothes in a shop. Heitz said she was placed in a psychiatric ward after spending a few hours in police custody. Thirty-seven people, including six firefighters, were injured in the blaze. One of the wounded has been described as an "absolute emergency" by the city's fire brigade revealed, meaning the injury is life-threatening. A fire service spokesperson told the AFP that the death toll could rise as authorities inspect the site. The fire started shortly before 01:00 on the upper floors of an eight-storey building on rue Erlanger, in the city's 16th arrondissement. Some 250 firefighters were deployed to tackle the blaze. In a statement, the fire brigade described the fire as "extremely violent" and said it safely evacuated more than 50 residents despite "extreme conditions." Residents, who crowded by their windows for help, were rescued with hand and hook ladders. The fire was eventually contained at about 08:00. "Save these people," she tweeted to the Paris fire brigade. "At this stage, and given the elements we have, it's the criminal thesis that is favoured," said Heitz. Daniele Giazzi, mayor of the 16th arrondissement, told CNEWS that there had been "a dispute between neighbours". A probe has been launched for "intentional destruction by fire resulting in death". In a statement posted to Twitter, city mayor Anne Hidalgo said "Paris is in mourning" after waking up to the news of the deadly fire. "My first thoughts are with the families of the missing. I offer them my sincere condolences. I want to tell them my deep sadness and assure them of all my support." The National Assembly observed a minute of silence to pay tribute to the victims. French President Emmanuel Macron thanked firefighters for "their courage" and said his "thoughts go to the victims." 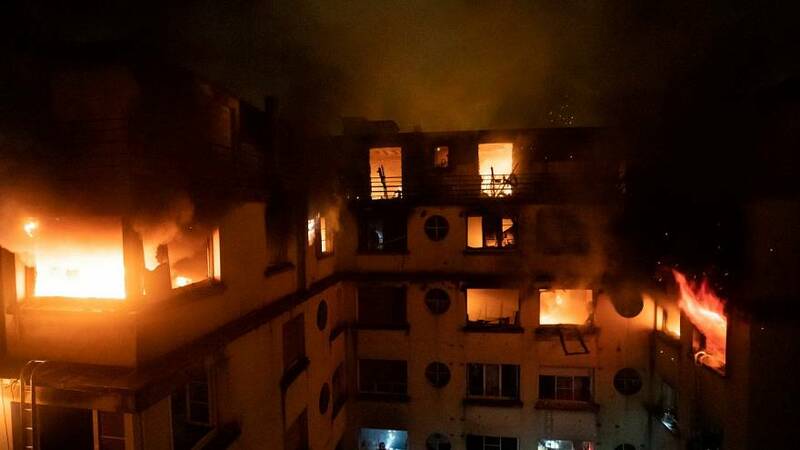 "France awakens with emotion following the fire rue Erlanger in Paris last night," he added on Twitter.